IPL T20 is perhaps widely accept and most watch premiere league across world. Some time back it was also called as “Cricket Ka Baap”. Interestingly IPL T20 and investments share lot of similarities. 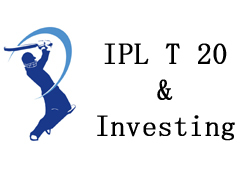 Let’s try to relate your investment and financial planning strategy with that of IPL T20 cricket format. In IPLT 20 game starting early always pays. As inning is short, team starting early can get more runs, which increases chance of winning game. Similar to this one should start investments at early age. Starting early and investing regularly means taking advantage of power of compounding to generate more wealth. In IPL team has to make more run in less overs. This will increase their chance of winning the game. Similar to that in investment you should try to get more return in less time. Getting more return in less time means accumulating wealth faster. In case of situation like rain or weather delays method used to declare result in IPL is Duckworth-Lewis method which sometime gives surprise. A team must be prepared for all surprise and the only way is through having already scored enough runs whatever the stage of the game. Similar to IPL life can give surprise at any time we have to be ready to deal with all unexpected that comes in life. So invest money only after keeping emergency fund aside. In IPL strategic break is taken after completion of 10th over. This strategy break is to decide what to do next in game. Similar to IPL one should take strategic break regularly to review portfolio and financial plan to decide what to do next to achieve financial goals. IPL is widely accepted because it is fast game in 20 overs everything is over. In order to win IPL team has to play offensive match. Similar to IPL in real life in order to win financial game sometime you have to play offensive and do risky investments. Bad over in IPL can change direction of game. If team does not have enough run on hand you may lose the tame. Similarly in real life you may come across bad over like bad time in term of job loss or illness if you are not ready with good financial score card situation may take you on toss. In IPL consistency in performance is preferred. Player who is performing consistently well in one season will get good reward not in current season but also in future IPL seasons. Similarly in real life we have to select consistent performer as investment asset. E.g Stock performing just for one year in your portfolio will not make any sense but consistent performer stock in your portfolio will give you good consistent reward. In IPL T20 match team keeps special coach for batting, bowling and fielding. Coach gives guidance and direction which will help team to perform well. Similar to this your investment can also get benefited if you take help from experts or financial planner while investing your money. IPL T 20 is highly entertaining in nature. All dance music and models dancing in stadium can make distraction to player, but player has to make sure that distraction and entertainment should not affect score card. Similarly in real life when it comes to investing emotional distraction can make big mistake. You need to control your emotion fear & greed while making investment decision. Hope you enjoy reading this article. Do share your comments in section given below.